A big smile. That was my reaction to seeing the names of Uhura, Spock, Kirk and Sulu on the latest map of Pluto’s jumbo moon Charon. 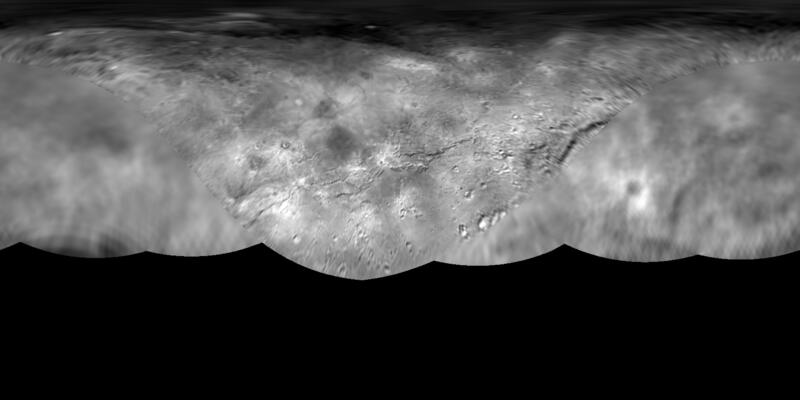 The monikers are still only informal, but new maps of Charon and Pluto submitted to the IAU for approval feature some of our favorite real life and sci-fi characters. Come on — Vader Crater? How cool is that? Four naming themes were selected for Charon’s features, three of which are based on fiction — Fictional Explorers and Travelers, Fictional Origins and Destinations, Fictional Vessels — and one on Exploration Authors, Artists and Directors. Clicking on each link will bring up a list of proposed names. Pluto’s features, in contrast, are named for both real people and places as well as mythological beings of underworld mythology. Clyde Tombaugh, the dwarf world’s discoverer, takes center stage, with his name appropriately spanning 990 miles (1,590 km) of frozen terrain nicknamed the “heart of Pluto”. Perhaps the most intriguing region of Pluto, it’s home to what appear to be glaciers of nitrogen ice still mobile at temperatures around –390°F (–234°C). There’s nothing like a name. Not only do names make sure we’re all talking about the same thing, but they’re how we begin to understand the unique landscapes presented to us by Pluto and its wonderful system of satellites. To keep them all straight, astronomers at the International Astronomical Union’s Working Group on Planetary System Nomemclature are charged with choosing themes for each planet, asteroid or moon along with individual names for craters, canyons, mountains, volcanoes based on those themes. Astronomers help the group by providing suggested themes and names. In the case of the Pluto system, the public joined in to help the astronomers by participating in the Our Pluto Naming Campaign. If you’ve followed naming conventions over the years, you’ve noticed more Latin in use, especially when it comes to basic land forms. I took Latin in college and loved it, but since few of us speak the ancient language anymore, we’re often at a loss to understand what’s being described. What’s a ‘Krun Macula’ or ‘Soyuz Colles’?